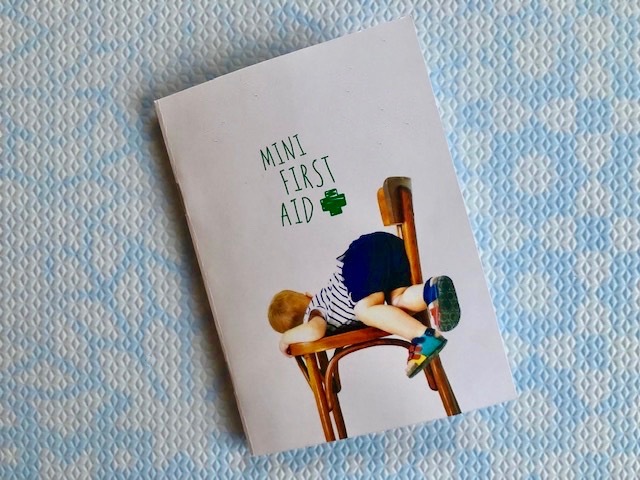 The other week my husband Oliver & I took a baby first aid class with Mini First Aid & our NCT buddies and below are a few important points that I learnt. I really enjoyed the two hour session and would recommend it to any new parents or parents to be as it could save a life. I loved the ‘hands on’ practicing and have already popped my mini first aid kit in my changing bag (scroll down to see what’s in it!). NOT BREATHING – If your baby or child isn’t breathing offer 5 rescue breaths first (mouth over baby’s mouth and nose or hold the child’s nose) before alternating between 30 chest compressions (1/3 depth = 4-5cm using 2 fingers for a baby or 1-2 hands for a child) & 2 breaths until the emergency services arrive. BURNS – Hold the burn under running cold water for 10 minutes; after you can wrap it in cling film to keep it sterile. To avoid burns in the bath always run the cold water tap first. CHOKING – If they’re coughing encourage them to cough but if they are silent but conscious you can offer 5 ‘back blows’ followed by 5 thrusts (on chest with 2 fingers for a baby & abdomen with arms around them for a child over 1). MENINGITIS – Symptoms include being abnormally drowsy, having a fever, vomiting, reluctance to feed, crying/restless, headache, dislike of light and rash. Call 999. CONVULSIONS – Commonly caused in young children by a raised body temperature (above 38 degrees C); they invoke violent muscle twitching, hot & flushed skin, twitching of the face & breath holding; you should protect the child with pillows and padding, remove clothing, ensure a supply of fresh air and put into recovery position before calling 999. CUTS & GRAZES – Irrigate with a large volume of water until clean, pat the wound dry with a sterile swap & cover with a plaster or low-adherent dressing. A cold pack can be applied to bruises & bumps. Never attempt to remove an object embedded into a wound eg glass as it may cause the bleeding to become worse. SPRAINS & STRAINS – Treat with RICE: Rest, Ice (for 10 minutes but avoid frostbite by wrapping an icepack with a damp tea cloth), Compression, Elevation. Do you have any baby first aid tips? Next Post My Useful & NOT Useful Baby Items!